Stained glass window restoration for Christ Episcopal Church. Since 1980 Rohlf’s Studio has been entrusted with the church’s stained glass restoration, as well as protective glazing, for Christ Episcopal Church in Greenwich, Ct. 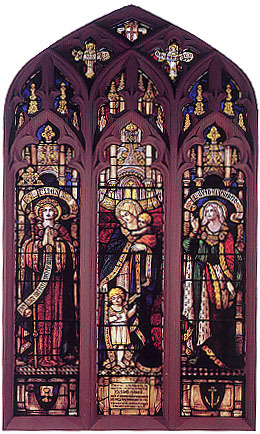 The church’s stained glass windows depicts a combination of many different stained glass artists from Louis Tiffany, Mayer of Munich, The Gorham Company, Heaton, Butler and Bayne, the Hoggson Brothers, Payne Spiers and few other unknowns. This compilation of artists allows to gives the church a very unique look, unlike any other. Recently Rohlf’s Studio completed the stained glass window restoration of the church’s Nave, East Wall Narthex window featuring Faith, Hope and Charity. While the artist is unknown the stained glass window was made in 1916. The stained glass window has a medieval theme with very ornate details and rich jewel colors in the garments. Restoring the stained glass involved an area of the Hope lancet window, where approximately 50% was broken and missing, along with the amber plating on the interior surface. The window was rubbed, stripped and cartooned. Glass color was then matched as well as painting and staining replicated. Amber plating was added to both the interior and exterior window installed.